Abrupt or impersonal messages can make the customer feel like they're fielding ads. Time your notifications wrong, and you'll end up diverting users' attention and stalling their progress. When used effectively, however, contextual notifications are a great tool for engaging users within your product or app. In-app notifications can gently guide users towards your product's most valuable features and educate them on the benefits. 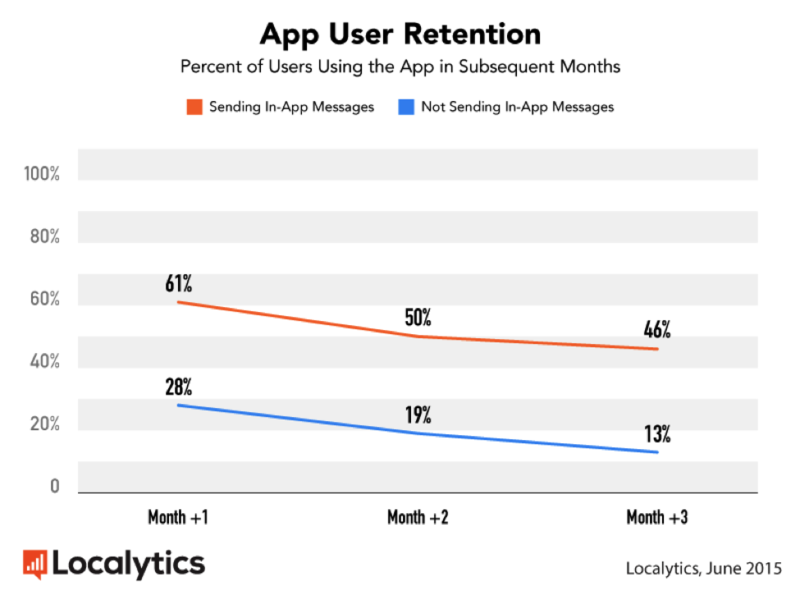 In fact, research firm Localytics found that mobile apps using in-app messaging have 3.5x higher user retention and 27% more app launches than those that don't communicate in-app. So how do you communicate with users within your app without coming off as spammy, or giving users a poor experience? How can you design your notifications around their needs instead of yours? To find out, let's look at three examples of notifications gone wrong, and figure out how to turn potential points of interruption into moments of value. We'll also suss out the difference between in-app messages and push notifications, and some best practices for using them together. First, a note on terminology. You may be wondering: What's the difference between in-app notifications and in-product? The answer: Not a whole lot, really. Both in-product and in-app notifications refer to the communications that happen inside a website or mobile app through slideouts, modals, tooltips, etc, rather than via email, for example. In-app is most commonly used to refer to mobile applications, but here the term applies to messages inside web apps, too. If you treat your user like every other user out there by sending mass, impersonal messages, they'll return the favor by tuning you out or leaving your product. In-app notifications are a critical line of communication—employ them with empathy or you'll risk polluting a valuable channel. New users were dropped directly into their dashboard and were greeted with guidance about things like settings and customer support. These are rarely the first steps that a new user would want to take. 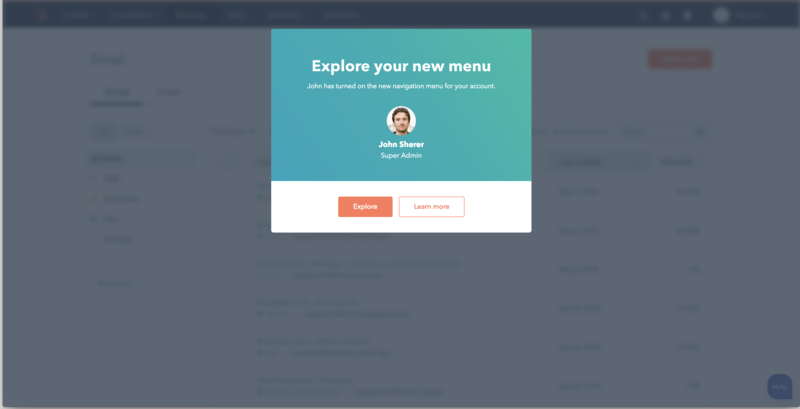 Mailchimp has since dramatically improved its new user onboarding experience. From a personalized, low-friction signup, new users are transported to a clean welcome page. Greeting users by name helps build familiarity and trust, while personalized messages guide users towards valuable content. ‍Mailchimp uses in-app notifications to drive even more personalization. The first time a new user logs in, a modal asks them to answer a few quick questions about their business. In exchange, Mailchimp offers more personalized marketing recommendations, tweaking their content based on the users' needs. That's about as personal as it gets. The best in-app messages make users feel like a product was made just for them. Mailchimp shapes every interaction around the user—it's crucial to make sure your own notifications always put users' needs first. Bad timing can turn a well-intentioned notification into a nuisance, no matter what purpose your product serves. 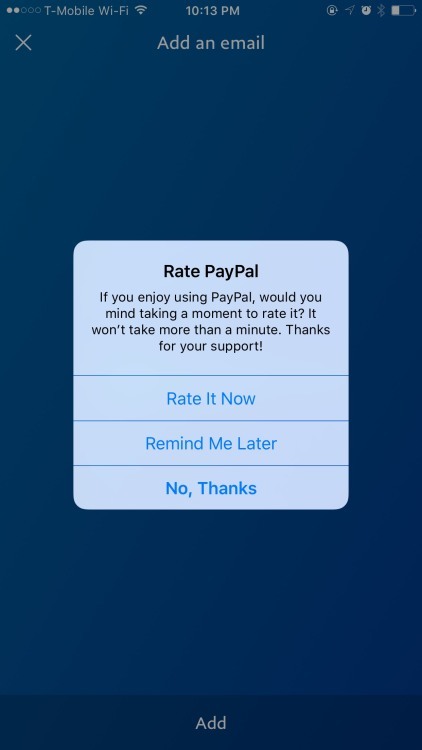 Even for users who truly enjoy using PayPal's app, untimely notifications erode trust and provide no value to the user. It's telling that the bold emphasis on the option to decline the request, as if the developers are expecting users to choose that option. Poorly timed in-app notifications can be fatal for user retention. Products attack users with advice about new features, requests for app store reviews, and updates that they think the user will appreciate But if these messages find the user when they're doing something else, or just trying to use the product in peace, they're likely to abandon your app, often for good. A little bit of context goes a long way. Think about where users are in your product, and what they're trying to achieve while there. A contextual update or request for user action is much more likely to get a favorable response than one that interrupts the user's workflow. 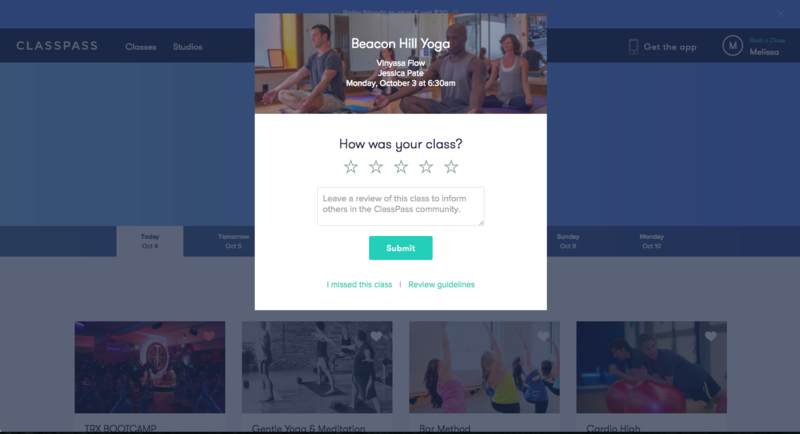 Fitness membership program ClassPass relies on user feedback to rate their video workout programs, but submitting a review is the last thing their users want to do right after a tiring workout. So instead, ClassPass times their feedback request notifications to pop up the next time a user opens ClassPass after completing a class. Because of the careful timing behind each in-app notification, ClassPass users are more likely to complete the desired action—in this case, leaving feedback on their prior workout. This approach also ensures the feedback process feels like a natural progression within the product experience, instead of an interruption. Study your user journey and use data to understand how users are really using your product to provide more valuable and contextual information. Communicating with your users at the right moments helps them become more successful with your product—and ultimately reduces churn. No matter how well-crafted and timely your message, if it's directed at the wrong person, it becomes nonsense. It's like a salesman talking about roofing solutions to a kid who's home alone, rather than waiting for the homeowner. 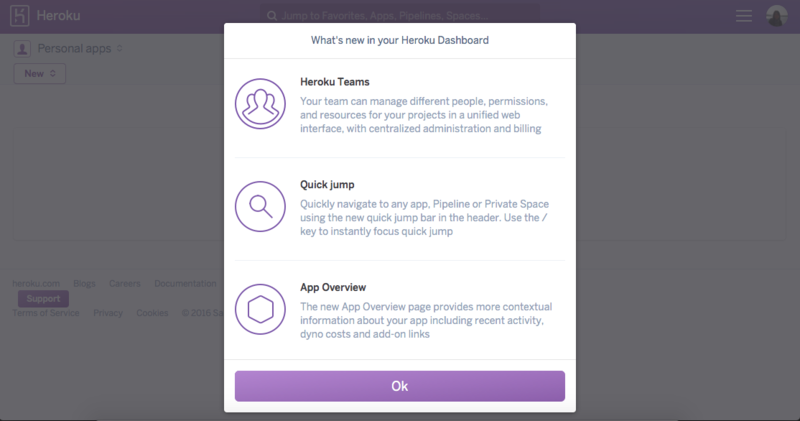 The modal window's easy-to-read design does a great job of introducing what’s new in the Heroku dashboard. But this modal is only really valuable to existing users: New users aren’t yet accustomed to what’s old in the dashboard—to them, everything is new. Bear this in mind when planning targeting for similar notifications in your own app. In-app tutorials and new feature announcements should be targeted to specific users. All those helpful tips your team wrote will help users get more out of your product, but if they are poorly targeted, some users may assume that none of your notifications apply to them and will opt out of the rest of the tour. Or worse, they'll suspect they're using the wrong product for their needs. 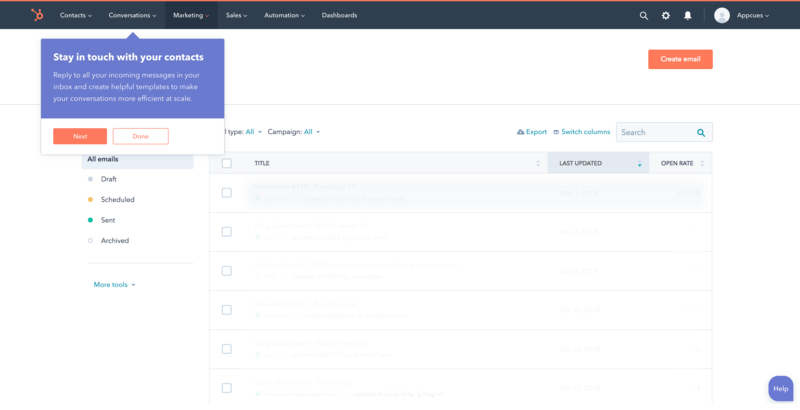 With new features being added to the product nearly every day, HubSpot needed a lightweight way of keeping customers in the loop. New feature modals and tooltips are triggered when users access features within the app, helping customers make the most of the app's capabilities. This targeted approach allows HubSpot to increase adoption by users who will benefit from the new features, without bothering those who won't. In-app messages and push notifications are most effective when used together. In-app notifications—like tooltips, modals, or onboarding sequences—let you reach a captive audience of users within your app. You can use these messages to create a structured process for nurturing users and increasing engagement rates, and for segmenting users to provide more relevant and valuable information. The downside, of course, is that users must already be in your app for this method to be effective. Push notifications, on the other hand, are a great way to reengage users when they're outside your app. If a user hasn't completed the onboarding process, for example, you can send them a push notification reminding them of the incomplete tasks. In-app messages and push notifications work best as two parts of a holistic messaging strategy. For example, push notifications can help re-engage users who are at risk of abandoning your app, funneling them into an in-app messaging sequence that guides them towards the desired action. Both sides of the coin are necessary to help your users reach their goals. Just be careful not to pester users with repetitive promotions and unwanted reminders—make sure every message is valuable and timely. Poorly implemented notifications can frustrate users, stall their progress, and even lead them to abandon your app. But when used effectively, in-app notifications can be a powerful tool for product and marketing teams. They can have a massive impact on how users experience your product. Craft and position your in-app notifications so that they're timely, targeted, personal—and part of a delightful user experience, rather than an interruption. Katryna is the content marketing manager at Appcues. She's a Boston startup veteran with a passion for good storytelling and engaging content. Her non-Appcues time is spent traveling to strange new places, befriending street cats, and baking elaborate pies.